You are currently browsing articles tagged Irish Bars. The game of rings is an old Irish pub game. You’ll have to hunt to find a place that plays it, but it’s a game kids will love. 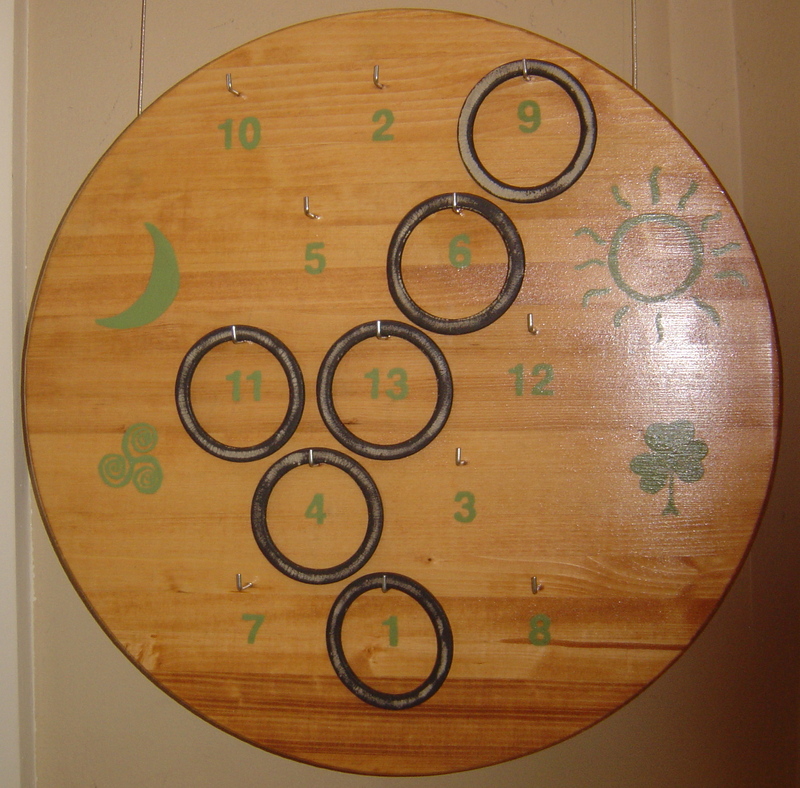 Back in the 1950s and ’60s, rings was a common game in many Irish households. It dropped out of fashion at some point, but it appears to be making a slow comeback here and there. Rings is simply a wooden board with 13 hooks mounted on the wall, at which you toss six rubber rings (like the small belts in old vacuum cleaners). Think darts, but a heck of a lot less dangerous if when the rings bounce back. As far as I know, there are only three pubs in my hometown that have ring boards these days, but there is a small and dedicated groups of “ringers” who frequent these pubs to play. When I was a kid, pool used to be the game of choice in our local, then gradually darts became more popular, and now it’s rings. The game is simple enough that kids can easily grasp it and join in. You simply stand the requisite distance from the board (I believe 8.5 feet is “regulation” — kids are usually let throw from a couple of feet closer) and throw your rings one at a time. I’m not sure if it was the way they were involved in the game by all the adults present, or the fact that we let them stay out until after midnight that appealed to my girls the most (and they weren’t the only kids out playing rings that late). Either way, playing rings was a highlight of our last trip home. Each hook has a set value (1 through 13) with the highest value being in the center. Each ringer totals up the rings that landed on hooks and subtracts that total from the number you’re shooting for. As you get down to the wire, each team must go “out” (i.e. reduce the target number to zero) in one ring. (So, once the remaining target is 13 or fewer, you must land the ring on that number.) Then, you, and any team members who have not thrown in this final round, aim for the 1. The more 1s you get the better. The other team then finishes out their round, and they can still beat the first to finish if they throw more 1s than the other team. It keeps the game close and ensures that skill and proficiency counts for more than luck. This Christmas, I made a ring board for the family. We’ve already had friends over and introduced the game to the neighborhood, and everyone enjoyed it immensely. The board I made isn’t quite “regulation” as I used regular cup hooks instead of the slightly different hooks they use in Ireland, but it’s near enough for practice. (You can theoretically land 3 rings on each on the hooks I used, I’m not sure that the hooks in Ireland are big enough for more than two.) I was thwarted in my efforts to find a ready made shield-type board in local craft stores, so I opted for a pre-made pine table top that’s bigger than strictly necessary. I also painted the numbers below the hooks, instead of above them. This was because the rings can cover the numbers on some boards I’ve seen, making it difficult for kids or the novice to total up the score. With the numbers below the hooks, the number is clearly circled by any ring that lands on the hook, making scoring quick and easy. Anyway, the resulting board is providing fun for all and allowing us to brush up on our rings skills so we can hold our own with the pro ringers next time we’re home in Ireland.